North Korea announced recently it has successfully launched an intercontinental ballistic missile (ICBM) that could reach US soil, which is believed to have posed a direct threat to the US. With an increasing sense of insecurity, the US has adopted a hardline stance toward North Korea. It's expected that North Korea will be able to produce a "reliable, nuclear-capable ICBM" program as early as next year, dramatically shrinking the timeline for when Pyongyang could strike North American cities with atomic weapons. US President Donald Trump called the test-firing of the ICBM "only the latest reckless and dangerous action by the North Korean regime." He also vowed to take "all necessary measures" to protect US allies from North Korea and said he was "very disappointed in China." Apprently, as Trump deepens hostility toward Pyongyang, he will consequently impose pressure on China. It's expected that this will further intensify the confrontation between the US and China, Russia, resulting in a worsening situation on the Korean Peninsula. China should explain to the US its sincerity of sanctioning North Korea by banning the import of North Korean coal, and dispel groundless accusations from the US. Meanwhile, the US has taken a set of military actions in response to the provocations from Pyongyang. The militaries of the US and South Korea fired missiles into the territorial waters off South Korea's east coast in what the US army described as a "combined training event." It involved the use of a surface-to-surface army tactical missile system and South Korea's Huynmoo Missile II. The US navy flew two supersonic B-1B bombers over the Korean Peninsula in a show of force against North Korea. And a THAAD interceptor was launched from the Pacific Spaceport Complex - Alaska. An unarmed ICBM was launched from Vandenberg Air Force Base early Wednesday to test the weapon's reliability to "defend against attacks on the US and its allies." The US aims to show that it is not only able to intercept missiles, but also can retaliate against countries that fire them. This confrontational countermeasure by Washington will deteriorate the security situation on the Korean Peninsula. The US Congress overwhelmingly passed a bill that could impose harsh sanctions against North Korea, in a bid to urge the country to abandon its nuclear programs. After the bill takes effect, the US will ban other countries from selling and transferring crude oil and petroleum products to North Korea and sanction other countries for hiring North Korean workers. 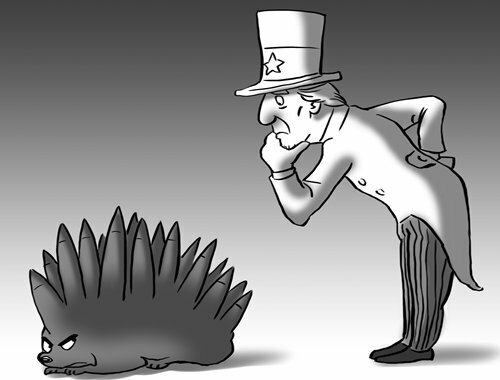 The US will also impose secondary sanctions on China which it believes did not impose enough sanctions on its neighbor. Susan Thornton, acting assistant secretary of the State Department's Bureau of East Asian and Pacific Affairs, said the US would impose sanctions on Chinese firms or individuals with alleged economic and financial links to North Korea's missile and nuclear programs. The US wants to urge China to show a clear stance on the North Korean nuclear issue through such sanctions. The differences between China and the US are expected to expand, and North Korea will resist with more fierce reactions. The security situation on the peninsula will deteriorate even more. Currently, denuclearization of the Korean Peninsula can hardly be achieved through dialogue with North Korea. The attempt of the international community to prevent Pyongyang from developing ICBMs has ended in vein. This makes the US angry and depressed. Both the US government and the public have proposed new plans on the country's North Korea policy, one of which argues that China and the US should jointly rebuild the security balance of Northeast Asia including the Korean Peninsula. With North Korea developing its nuclear and missile capabilities, the US seems to have come to a crossroads - either admitting North Korea's nuclear status or launching military strikes on North Korea which may cause countless deaths of civilians. It is likely that the US has to accept a nuclear-armed North Korea. How to realize peaceful coexistence with a nuclear-armed North Korea is the next thorny issue that US has to deal with.